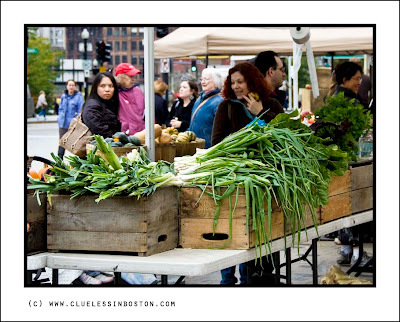 Farmer's Market on the plaza in front of South Station noontime. Here is a shot I took of the farmer's market a few weeks ago at the end of the day. I like the way the light is shining on the leeks. Those are some giant leeks by the way! The lady looks like she's trying to decide what to have for supper - I know that feeling! Our outdoor markets are finished for the season. I wonder how much longer yours will continue. Hmmm, leek and potato soup. Perfect for a cold and rainy day. Yes, please pass the leek and potato soup. Our (outdoor) farmers market ended last week. A nice photo, with the cluster of faces and the "drape" of the leek-tops. Looks like a different place! It's Soup time on the market with those leeks. You're so lucky to have a farmer's market like that! Beautiful moment and capture! Congrats!